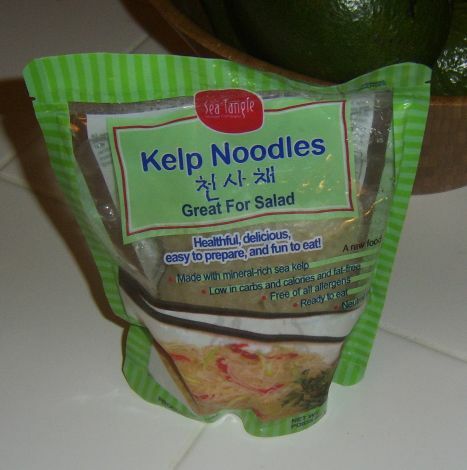 At my first Raw Spirit Festival in ’08, Sedona AZ, I came across Kelp Noodles. My friend John Schott from LifeFood Gourmet had a table at the festival and made an awesome tomato Italian sauce for these noodles. I got the last bowl he was selling and boy I’ve been hooked since then! So when we got back to FL, Denis went online and looked them up… he ordered them and I’ve been making different sauces for them. My favorite is Coconut Curry sauce I created by accident trying to copy a red Thai chili sauce. What I enjoy most about this sauce and the noodles is that is easy to prepare and makes a great “fancy” meal when I’m tired and don’t want to send a lot of time in the kitchen. First make the curry paste by putting the garlic, cumin, curry, coriander, turmeric, ginger, cilantro, chilies, salt, lemon, olive oil in the food processor and mixing until it becomes a paste. Add the nut milk and coconut oil and continue to mix. Rinse the noodles well and put aside in a bowl to mix. 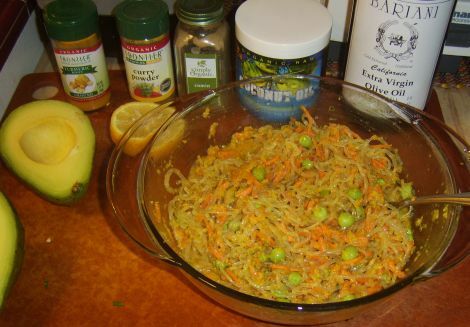 Add sauce, red pepper strips, and optional vegetables (peas, carrots, celery). Mix well and let it sit for a few minutes. 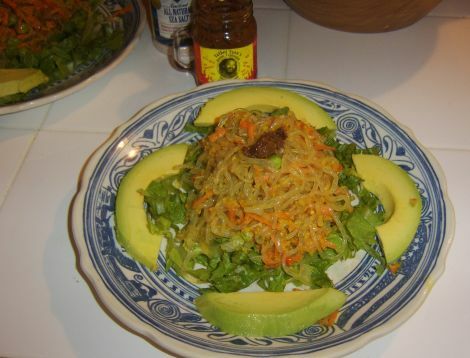 Serve over a bed of lettuce with avocado.